With so much going on in the World Shakespeare Festival at the moment it’s hard to keep up. I spent last week away, with no TV or internet access and just catching programmes I missed is quite a job. Among Italians, Shakespeare is certainly the best-known foreign writer. It’s interesting for us to see how he describes Mark Antony, and how his Octavius resembles Machiavelli’s Prince. But the most important this is the way he described emotions that are universal. It hits you like a punch in the stomach. 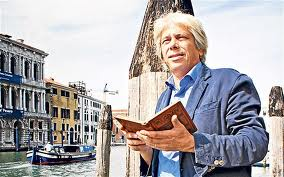 In the first programme he talked about Shakespeare and the universal emotion of love, but the one going out this Thursday looks at the political landscape, visiting Venice’s Jewish ghetto, Rome and Sicily which the Radio Times confidently assures us was the setting for The Tempest. Really? The Sunday Telegraph on 6 May ran a three-page piece on the programmes in its Travel section, which in itself tells us something about the aims of the series. It does sound more like an advertisement for the beauties of Venice, da Mosto’s home, than an attempt to find Shakespeare connections, some of which seem a little strained. In The Merchant of Venice, Launcelot Gobbo gives deliberately confusing directions: “Turn up on your right hand at the next turning, but at the very next turning of all, on your left…turn of no hand but turn down indirectly”. This, the programme suggests, is recognisable as Venice with its maze of alleyways, as if Venice was the only city with a complicated layout. Da Mosto has his own ideas about the identity of Othello which I suspect indicate more about the myths and legends that have sprung up about Shakespeare in the past four hundred years than actual fact. But even if the programme doesn’t provide any new insights into the “did he or didn’t he” question it’ll be worth watching for the images of this beautiful country, accompanied by the always charming Francesco da Mosto driving his Alfa Romeo. 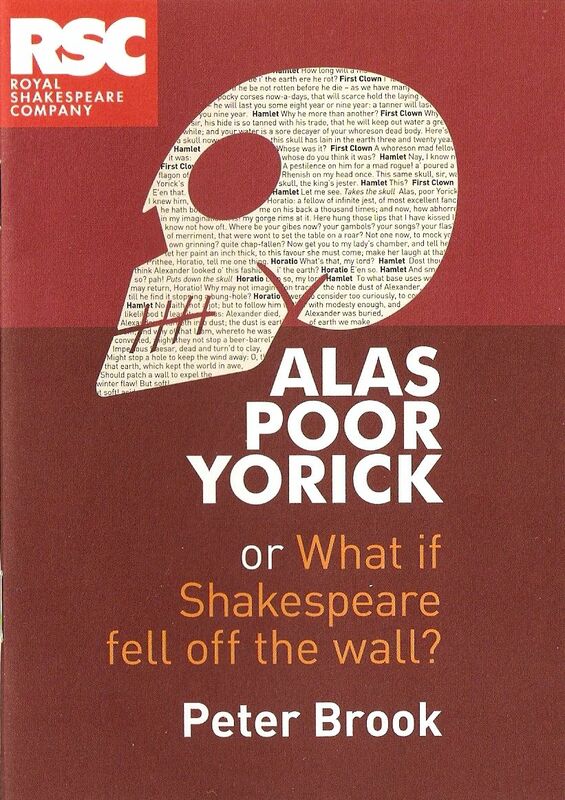 On returning to Stratford I wandered into the Royal Shakespeare Theatre to find a little pamphlet discussing Shakespeare’s life, entitled Alas Poor Yorick, or What if Shakespeare fell off the wall?, written by Peter Brook. The eminent Shakespeare director’s essay has been published to celebrate Shakespeare’s Birthday and as a tribute to Michael Boyd who leaves the RSC later this year after ten years as Artistic Director. I was quite surprised to see Peter Brook joining the fray surrounding the authorship question, but as the most important figure in theatre in the second half of the twentieth century, nobody is better qualified than he to point out the impossibility of an imposter being able to pass himself off as the author of the plays. No one smelt a rat amongst all those spiteful and jealous rivals? I’m sorry academics – if you’d been part of any rehearsal process you would think differently. Even today, imagine a phoney writer. The cast would begin to notice and gossip about the fact that every time you ask something, the author slips into the wings with his cell phone. But Shakespeare was unique. He never judged – he gave an endless multitude of points of view with their own fullness of life, leaving the questions open both to the humanity and to the intelligence of the spectator. Copies of the essay are being given away in the theatre and there’s an article in The Daily Telegraph giving more details. Later this year it will form part of a new book on Shakespeare by Peter Brook, The Quality of Mercy, being published by Nick Hern Books. 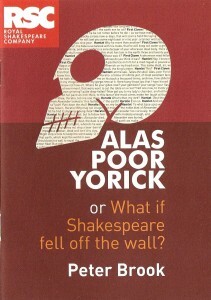 This entry was posted in Legacy, Shakespeare's World and tagged Alas Poor Yorick, authorship, BBC, Francesco da Mosto, Italy, Nick Hern Books, Peter Brook, Shakespeare in Italy, The Quality of Mercy, Venice. Bookmark the permalink.